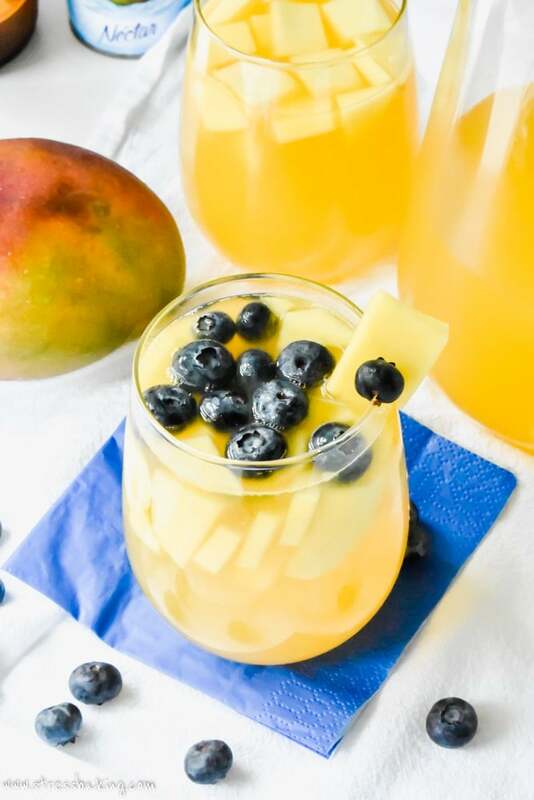 A bright, crisp and refreshing summer sangria filled with the flavors of sweet mango and zesty ginger! I don’t want to take up a ton of your time, so we’re gonna take a small detour before we get to the recipe. Guys… wedding planning takes up a lot of time. If you’ve planned a wedding, this isn’t news to you. If you haven’t, here’s a snippet: You’re researching, calling people for pricing, emailing vendors, setting appointments, booking hotels, introducing and reintroducing yourself to everyone you talk to, jotting down ideas, analyzing every friendship you’ve ever had and whether or not they’re wedding invite-worthy, DIYing, decision making, and doing it all with a smile on your face. We’ve been trying to get as much done right now as we can, because we decided to get married in February of next year. We’re wasting no time getting everything situated so that by the end of the summer, we can breathe easy and just wait for that magical day. The goal is for this to be a fun party, and we’re not focused on the little details like place settings and linens. They just aren’t the priority for us. I know some people LIVE for planning that sort of thing, but in the end all we care about is good food, good company, laughter, dancing, and a crapload of pictures to remember the day. So all that said, I haven’t had much time for baking. It’s also been approximately a million degrees with high humidity every day for what seems like forever, so there’s really been no desire to whip up a batch of… well, anything. Except this sangria. It’s cold, it takes ten minutes to make, and it’s perfect to sip while lounging in a chair surrounded by dozens of wedding invitation samples when you’re trying to decide if foil press greenery on 130 lb paper is the way to go. The sweetness of the mango is complemented by zesty ginger, and for some reason it makes me feel healthy when I’m drinking it. Mind you… it’s not. I mean, it’s not awful for you, but it’s certainly not health food. But, you know, fruit and stuff. 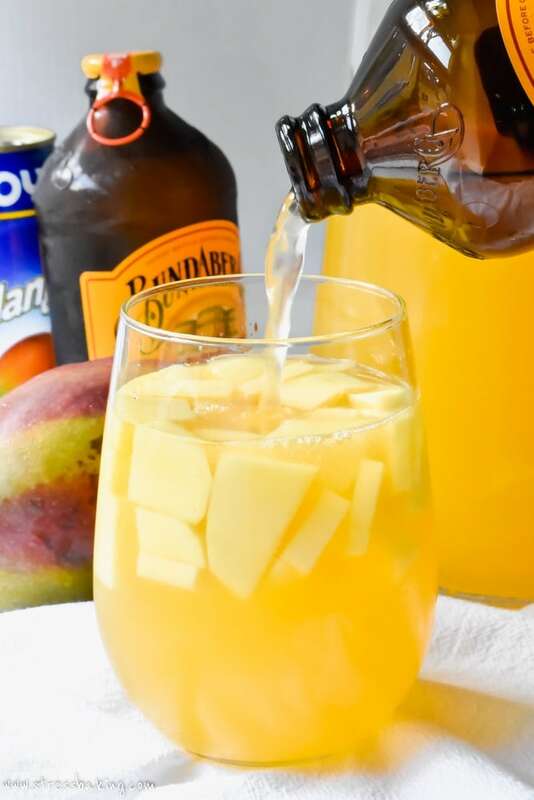 I personally enjoy using Goya mango nectar and Bundaberg ginger beer when I make this, but you can of course use whatever you like and/or have that’s convenient. 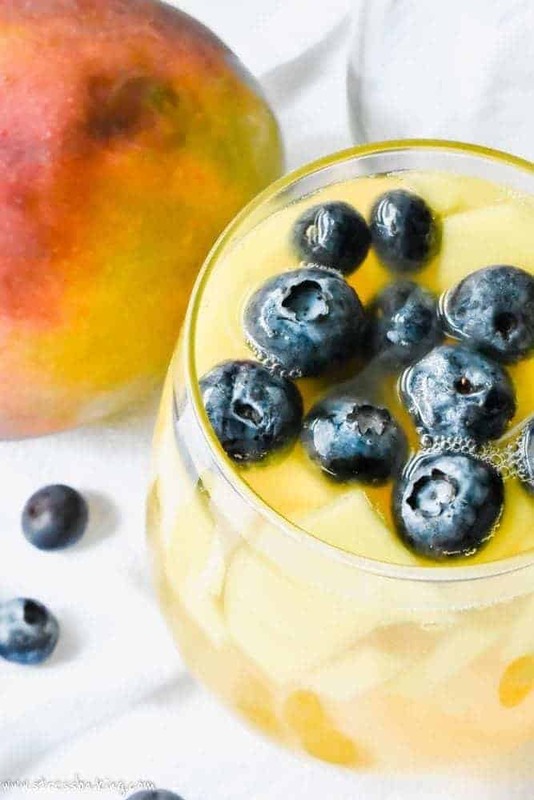 You don’t have to have fresh mango for this, but trust me – you’ll be missing out on boozy little chunks of mango heaven if you opt to leave it out. I like to add an extra fruit or two to mine, just to give it a little color. 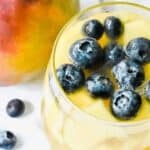 Blueberries, strawberries and peaches all work beautifully! Strawberry Ginger Pinot Sangria by Mighty Mrs.
Raspberry Rosé Sangria and Blood Orange Sangria by yours truly! 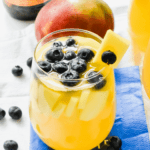 In a large pitcher, combine white wine, mango nectar, triple sec, mango, and ginger (as much as you’d like, to taste). Stir to combine. Just before serving, stir in ginger beer and any extra fruit you’d like to add as garnish. Serve and enjoy! You know I’m always down for sangria! Summer just is not summer without sangria. The perfect patio and BBQ party drink. Love the combination of flavours here. Makes you feel like you are in the tropics. With the HOT weather we have been getting, I feel like I am in the tropics…and could have used a few of these. Yummy! I’m always up for sangria! I love that you use ginger and ginger beer in yours! I am going to my brothers for the weekend and now I know what I’ll bring!! I love making cocktails with ginger beer, the bite is so good! I bet it’s fabulous with the mango, perfect for by the pool! I’ve put ginger ale in sangria before but never fresh ginger or ginger beer. What a great combo! It looks so refreshing – perfect for a summer night! I LOVE a good sangria! 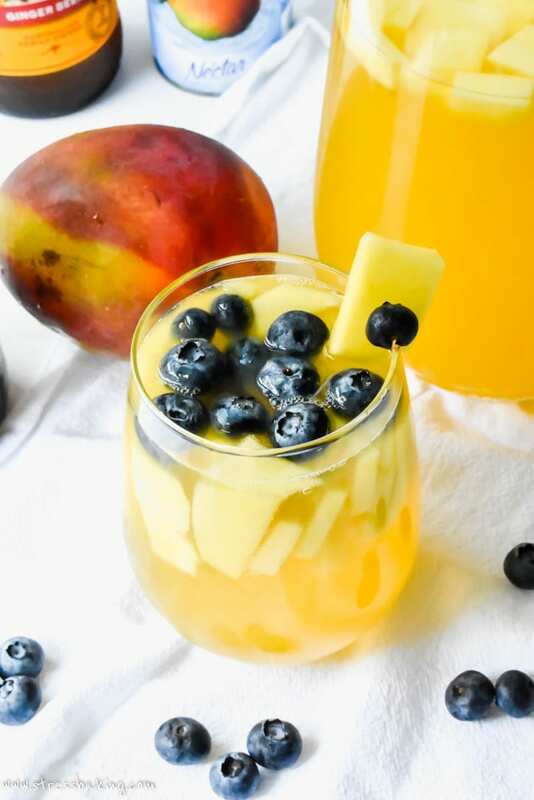 This recipe gets bonus points because it has my favorite fruit MANGO! ? I’m a huge fan of sangria, especially in the summer. I don’t know why I’ve never thought of adding ginger beer to it! I live on Sangria in the summer. Loving everything about this one and gotta make it ASAP! Sounds and looks refreshing and SOUNDS like you deserve this drink more than the rest of us! You forgot one thing on your list of wedding preparations/analysis…crying. When I researched all that for my wedding 13 years ago I cried at the price and preparation. So we married in Vegas and spent 2 weeks in Hawaii for our honeymoon! Your cocktail sounds PERFECT for this summer heat though!! Thanks for sharing! 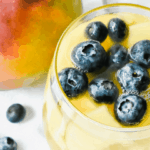 Talk about the perfect summer drink to keep the party going! Love the ginger beer and that you are also using fresh ginger.. such great flavor combinations with the mango. So different and looks refreshing. Speaks summer to me. I love the idea of the ginger in the drink, it sounds wonderful, can’t wait to try it!